Ben Mendelsohn is having quite the moment, and if those "Star Wars" rumors end up being true, he's bound to become a household name in Hollywood. The Australian actor has been well-known back home since he was a teenager, but you've likely seen him more and more recently in American films and TV shows. He was killed by Bane in "The Dark Knight Rises," played Jessa's father in HBO's "Girls," and appeared alongside Brad Pitt in "Killing Them Softly." This year alone, Mendelsohn's credits include Netflix's "Bloodline," Ryan Gosling's directorial debut "Lost River," gambler film "Mississippi Grind " and indie Western "Slow West." Let's also not forget that he might star alongside Felicity Jones in "Star Wars: Rogue One." In John Maclean's feature film debut, "Slow West," Michael Fassbender (who previously worked with Maclean on two short films), plays Silas, a mysterious traveler headed west in 16th-century Colorado. Silas helps 16-year-old Scottish boy Jay Cavendish (Kodi Smit-McPhee) on his journey to find the girl he loves until they run into Mendelsohn's Payne, a villainous leader of a gang of bounty hunters. The Huffington Post sat down with Mendelsohn at the Tribeca Film Festival last month to discuss the wardrobe he took home from "Slow West," who he'd like to play in the "Star Wars" universe, and his bizarre dance in "Lost River." I loved "Slow West." It’s so beautifully made. Payne's coat is amazing! Did you get to keep it? It’s cool. It’s been a great several years. I came here for a very, very long time and just couldn’t get any sort of traction going. There were a couple of people who liked me, but it didn’t translate into anything that was employment based. I like to think that what really helped it was the one-two punch of "Animal Kingdom" and either “Place Beyond the Pines” or “Killing Them Softly.” Those combined really seemed to set some wind in the sails. It’s been a dreamy couple of years. They -- I can definitively and honestly say to you that I have no job yet that I know of to go to. That may change. I would be very happy if that came to pass, but at this stage it’s just chatter. It would depend. I think that the Empire has such room. We only know of a few people on the Empire side of the fence. “Star Wars” is populated by so many great types, who wouldn’t want to be a Han Solo kind of dude? And then you’ve got the whole Luke strain. I don’t think that they’re likely to -- I’d be thrilled, actually, if they were looking at me for a Skywalkery-type of a number. But yeah, there’s a lot. No, I’ve never sung before. That’s me doing my Frankie Laine impersonation. There’s a little film I did where I sing a bit, but nothing like that. And the dance was something we just figured out very last minute just before we were going to shoot the scene. We knew we had it coming up and I went down there and we put on a A$AP Rocky track and just danced off. Yeah, I was familiar with the opus. I’m a reasonably -- I have my phases -- but I really like music. 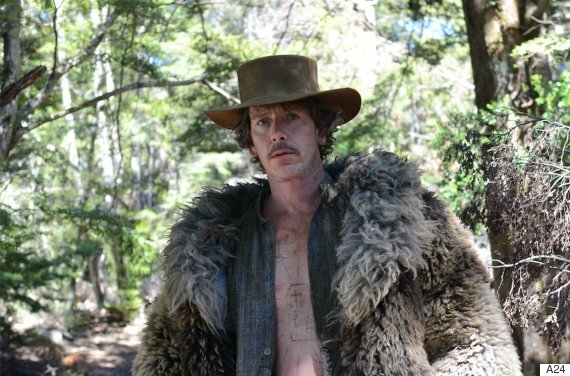 "Slow West" is now playing in select theaters.